The middle school library will be open every Monday this summer starting June 4th through August 13th from 4:00 pm to 7:00 pm for our students to continue to utilize the books and the newly transformed space without interruption. Come enjoy the 300+ new books that have been donated through the generosity of our fabulous students, staff, and community. MS PTO will sponsor two (2) $25 drawings for the Book Fair for students that visit the library this summer. 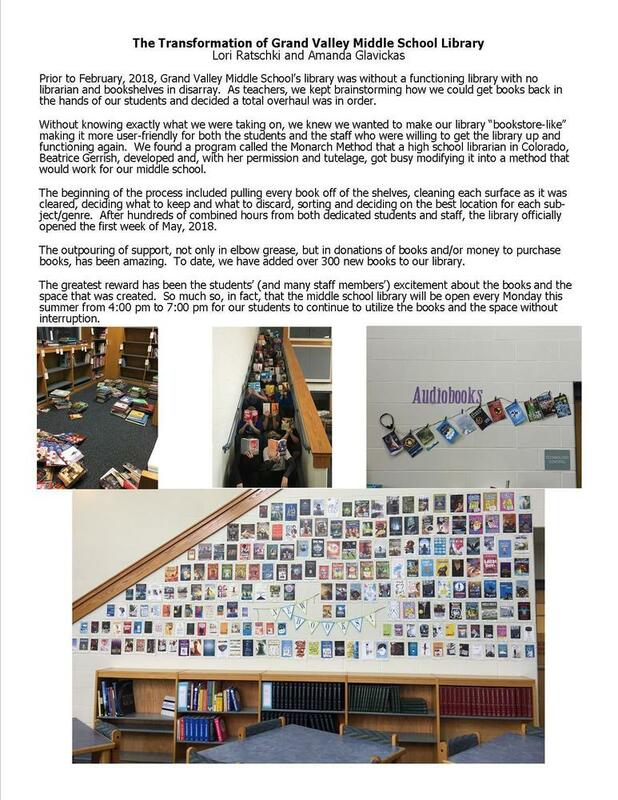 Please read attached "The Transformation of Grand Valley Middle School Library" (with photos) by Lori Ratschki and Amanda Glavickas. It was a monumental task, but so worth it when you see the students who wants to be in the library learning and reading. Please take advantage of this amazing program over the summer, spread the word, and let's pack the MS library on Mondays from 4:00-7:00 pm!